Friday 17 December 2010, the School of Media Arts of Silpakorn University, will present a multimedia exhibition by the artists Seubsakun Sarunputi, Martino Nicoletti, Toeingam Guptabutra and Alessandra Campoli. 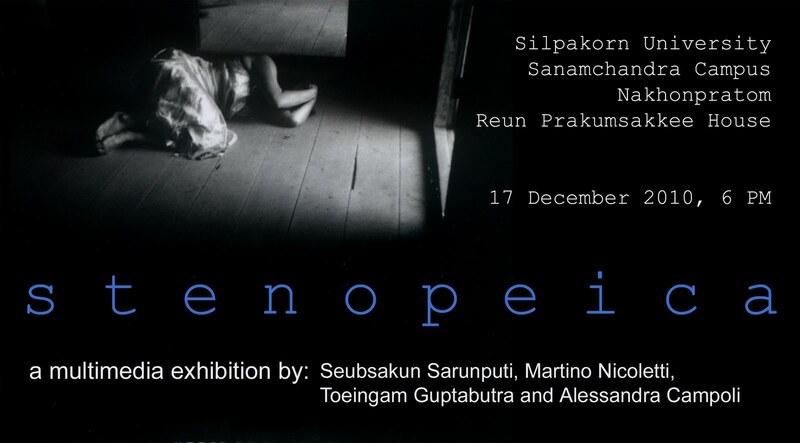 In the suggestive framework of an abandoned traditional Thai house, the exhibition will display the results of an original combination of photography, visual poetry, writing, music, installation and performance. Common denominator of the collective event is the idea of “stenopeica”, meaning “pinhole”: a sharp gaze through narrow possibilities for sight. Reun Prakumsakkee House, 6 pm.